With unique temperature monitoring & temperature control capability, Colnatec sensor heads are arguably the most accurate yet most affordable film thickness measurement devices available. A variety of options are available. Eon-LT™ is a temperature measuring film thickness monitor. This product surpasses conventional monitors that are blind to thermal changes of the crystal. The combination of frequency and temperature measurement allows unprecedented accuracy. 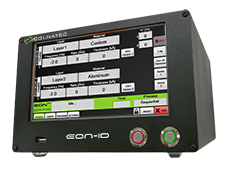 Featuring integrated display, intuitive GUI, and durable architecture, Eon-ID™ is a new film thickness controller that packages an ultra-high resolution deposition control system into a compact, rackmountable enclosure.